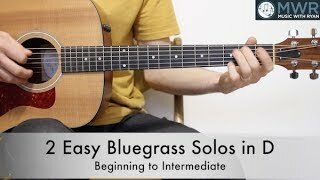 This week's featured lesson is an original composition I created using a very common chord progression in the key of D. It's entitled '2 Easy Bluegrass solos in D' and we'll be focusing on two concepts for this lesson. For the 1st arrangement, we'll be making use of the D major pentatonic scales in 'open position.' In the 2nd arrangement, we'll be using multiple chord shapes up the neck and playing phrases around them. This lesson will give you lots of ideas on soloing out of the 'D shape' in both 1st position and up the neck. Go ahead and give it a listen!